Learn more about kangaroos at Conservapedia. Did Kangaroos once live in the Middle East? "No, of course not! Kangaroos live only in Australia." Prior to and just after the Flood, the Earth's continents were joined in a super-continent today called Pangaea (Greek for "all Earth"). Evidence for this comes from the jig-saw shape of the continental plates as well as Biblical evidence. The Bible tells us that when God created the Earth it was without form (Gen 1:2), meaning that the land wasn't yet broken into distinct continents and was one amorphous mass. Also, God tells us that He gathered the waters under Heaven unto one place (Gen 1:9), meaning the single Ocean surrounding the super-continent. Animals leaving the Ark immediately after the Flood would have had easy access to migrate to all the lands of the Earth. (There is also an alternative theory that some kangaroos and other baramins destined for Australia "rafted" across the Tethys Sea on floating mats of vegetation ripped up by the Flood. However, this is still controversial.) Pangaea gradually started to break apart after the Flood, most likely due to the effects of rapid soaking and drying of the land. As you can see, the logic is inescapable -- Kangaroos must have once lived in the Middle East. Any claim that they didn't must then be treated as refuted. But still there are questions that are left to be investigated. For instance: why are there no kangaroos left in the Middle East? how come we do not hear of kangaroos in the histories of the region? and how did the kangaroos get to Australia? First, let me point out that the word "kangaroo" was coined by the Australian Aborigines after both they and the kangaroos had migrated to the Australian continent (which, at the time, was still indirectly connected to the Middle East, see inset). 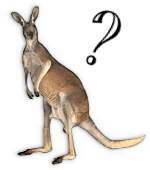 The word kangaroo means "I don't know" in Aboriginese. The story goes that when the first modern Europeans arrived in Australia, they saw a large hopping animal and asked one of the natives what it was called. "Kangaroo [I don't know]," he responded. It is understandable that he couldn't name the animal since his people had lost all knowledge of their Biblical heritage and thus would not have known the name given to the animal by Adam (Gen 2:19). Obviously, the peoples of the Middle East would not have called these animals by the name "kangaroo", and so the naive assertion of Biblical skeptics that since the word "kangaroo" is absent from the ancient Middle East so too must the kangaroo be, is patently absurd. That kangaroos are not mentioned in the Genesis account of the Flood, either by name or description, is unsurprising due to the great number of kinds of animals that were in the Ararat area at the time. What's a kangaroo or two among a great throng of pandas, mastodons, velociraptors, and giraffes? It is also likely that the kangaroos only spent a relatively short time living in the Middle East, needing to leave with greater haste than other animals in order to reach their appointed destination before the breakup of Pangaea (see next section). However, evidence of the kangaroo's migration through Europe can be found in the reports of satyrs. Satyrs, which many believe to have been strictly demonic in origin due to the goat like features attributed to them by Pagans, were actually a conflation of demons and kangaroos by the ignorant Pagan natives of Greece. It is easy to see that the well-known features of satyrs -- two-legged, upright stance with elongated metatarsi; hirsuteness; a tail; long, pointed, horn-like ears; long or bearded face -- closely coincide with the general kangaroo body form. The more goat-like attributes, such as cloven feet, were no doubt due to confusion in the wine-addled minds of Dionysian cultists between kangaroos and the demons that the cultists consorted with, which manifested in goatish forms. Furthermore, satyrs are mentioned in the prophesies of Isaiah as properly translated in the KJV, and thus we do find kangaroos in the Bible. Isaiah prophesies the destruction of Babylon, warning that it will not be inhabited, but that "satyrs shall dance there" (Isa. 13:21 -- note that "dance" here is economically translated from the Hebrew raqad, which has a fuller meaning of "to skip/spring about or to leap"). This prophesy proves that at least some kangaroo stragglers could still be found in the Middle East up to the fall of Babylon in 539 BC. Kangaroos were not the only marsupial kinds that once lived in the Middle East just after the Flood. In fact, they all did, along with all the other animal kinds that we see today. The current bio-distribution is due to migrations outward from Mount Ararat and subsequent local repopulations and micro-evolving (i.e. degenerating) inside of the kinds. A naive question that a Biblical skeptic will often ask is: "How could Koalas have lived in the Middle East if there were no eucalyptus trees there?" The answer to this is simple when we remember that the Lord's creations were created before the Fall and that their current physiological state is the result of the degeneration (due to the effects of entropy) of their original, more informationally-complex genes. In the Garden of Eden, koalas ate of all the trees (save the Tree of Knowledge, of course) not just eucalyptus trees. The two koalas who were aboard the Ark must have not yet degenerated to being only able to subsist on eucalyptus and this state of affairs must have happened after they migrated to Australia. Early Middle Eastern koalas would have been happy to munch away on figs or the like.